Thanks to Victoria Day, many of us had an extended weekend of 3 days. I was one of the lucky ones. And let me tell you, the last few days have been great: I was at the beach, learned more about science, went to another country and flew over Canada. Sounds too good (or crazy) to be true? Well, let me tell you how I succeeded in doing so. 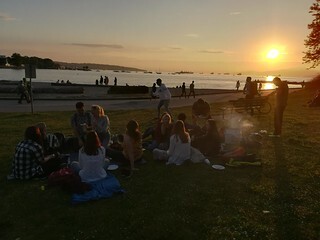 On Friday, we started the weekend in the best way possible: we had a barbecue at the beach! Sunset Beach was the location to be. The grill was ready from 6pm on. The smell of burger patties and sausages filled the air fast. This is how summers are supposed to be. I enjoyed my food, played Frisbee and had many laughs and talks with many of you. And let’s not forget the beautiful sunset we could all admire! New day, new activity: Saturday was all about science! Well, at least for several hours. We went to Science World and did many things: we saw a show about electricity, discovered the different galleries and engaged in several interactive demonstrations. I also took the opportunity to visit the exhibition ‘The Science Behind PIXAR’ – where I learned how some of my favorite childhood movies were created. In the evening, I met up with some of my favorite Swedish people. For a few beers only. Needless to say, it wasn’t a few beers only. But hey: I succeeded taking my last bus home. After a few hours of sleep, it was time to get up again. At 5:40am, my alarm went off. I obviously wasn’t very energetic, but it was time for me to leave the country. A day trip to Seattle was ahead of me. Yay, my first time in the US. Unfortunately, crossing the border took longer than expected, but the sun was shining for us in the city. 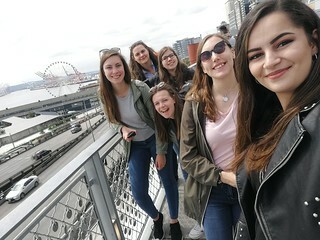 So, being a total tourist again for one day, I did what I had to do: visiting the Gum Wall, eating Beecher’s Mac and Cheese (soooo good, by the way), strolling over the Public Market, walking through downtown and enjoying the view over Seattle from the Sky View Observatory. When we came back to Vancouver in the evening, we ended the day with a few beers. On Monday – Victoria Day – I caught up on some sleep. It was not until 12.30pm when I crawled out of bed and took a shower. Then, I went to Canada Place with Kerstin to meet Billy. Time to do something fun! We decided to do ‘FlyOver Canada’. It is a virtual experience where you can fly over Canada. This, with the help of a spherical screen and suspending and moving seats. It was a wonderful experience, but I would have loved to fly a little longer than only 15 minutes. We ended our weekend the way we begun: hooray, a barbecue! I hope you all had a great weekend, too. I can’t wait to hear your stories tomorrow at our PuB NiGHT at Dublin Calling! Rain, light rain, showers. The weather forecast for this weekend does not seem that promising, but no reason to despair. Vancouver has many indoor activities to offer, so let’s take a look at your options to enjoy a fun weekend. Friday night. What about kicking off the weekend in one of the many pubs and clubs? My plan for tonight: Line dancing at the Yale Saloon. A professional dancer is showing the crowd how the real cowboys party. After the small teaching lesson, the night continues with DJ sounds and bull riding. Just enter before 9.30pm and you do not have to pay cover. Ladies, you even have free entrance until 11pm, since it is ladies night at the Yale Saloon on Fridays. If you are looking for something more relaxing, just take a walk in Gastown and get yourself a drink in one of the many cozy bars. Saturday = International Pillow Fight Day. All over the world, people secretly get together and do a pillow fight. Rotterdam, Barcelona, Vienna, Melbourne, Seattle, Hong Kong and many more cities participate and so does Vancouver. And we, of course! We will meet at 2.30pm in front of the Vancouver City Centre Skytrain Station. Bring your own pillow and join the fun! Afterwards, we are planning on going bowling. It’s a bit different than the European bowling, so you should definitely try it out. Sunday. After sleeping in and a great breakfast, it should be time for some relaxed indoor activities, for example a stroll in a museum. You can choose between the Museum of Anthropology, Maritime Museum, Police Museum, Museum of Vancouver, Art Gallery and many more options. There is something for everybody. 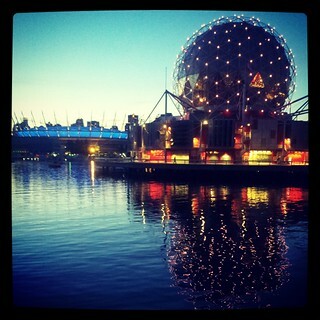 The Science World (exactly , the big shining globe near the stadium) is definitely worth a visit. Check out their current photography exhibitions “On the Spot: Instant Stories” or “GroundTruth – Anatomy of a Pipeline”. In the Science World, you can also experience a short movie shown on one of the largest screens in the world. Amazon Adventure, A Beautiful Planet and America’s Music Journey are currently on the programme. Even if it does not feel like Spring yet: leave the house and explore the city, there is so much to do. I hope to see many of you and your pillows on Saturday! It is a sunny Wednesday, which means we are going to save money again! In this Smart Saver I will give you examples of student discounts, like some of you I am still a student and you can have quite a few benefits from owning a student card. Like many cities in the world, Vancouver has a student discount card. Meet the SPC card, a card you can obtain if you are a student, which gives you 10 to 15% off on most of the popular brands like: Forever 21, Blenzz, Taco Bell, Levi’s, Bath & Body Works and PINK by Victoria Secret. You can get the card for only $10 by registering online at spccard.ca. To see where you can save some money, they have a very handy app where you can see the best deals. The card is only usable during school periods so if you sign up now, you have awesome deals till July 31st. Do you want to discover Vancouver on another level? Seair Seaplanes offers beautiful sightseeing flights to nice destinations. And even better; they have student discounts. For example, you can already do some sightseeing in the air from Vancouver to Vancouver Island for $74.58. Rather not travel by plane? Greyhound offers transportation by bus and gives students discounts of 10 percent or more, this will depend on where you go though, but the offer is there! Did you read all of this but you don’t have a student card? Don’t be sad, we come up with great deals every Wednesday! And if you are going to do groceries always check the weekly flyer for the best deals. One last tip: do you like Urban Outfitters as much as I do? I discovered that if you create an account in their app you get 10% off on your first purchase! After that you will get other great deals in the app. A bonus for the students; at Urban Outfitters you get 10% off with the SPC card as well! Hope to see you tonight at the Distillery! INTERNeX Canada: New Fun Facts ! Cameras, spotlights, decoration, a “don’t cross” line, lots of people working, another ones responsible for the security of the assembly area, and so….Yeah guys, I’m talking about shoots in Van !! This picture was more than a month ago, for those interested it was the movie Godzilla, but I didn’t write because of this movie. It’s amazing how many shootings we can find in Van City. They are everywhere…In Gastown they use to shoot a lot for example. Yesterday, they were shooting in front of the police station next to the Science World, and it’s very usual to find a shot in Downtown. A few days ago, it was revealed that the world famous 50 shadows of Grey will be filmed in Vancouver too. And it’s normal, because Vancouver is a beautiful city which offers every kind of environments: from the perfect skyline of Downtown and its modern buildings…to the wilderness; amazing mountains and the relaxing Pacific Ocean. For that reason is not hard to believe that BC is one of the largest North American film and TV production centres. 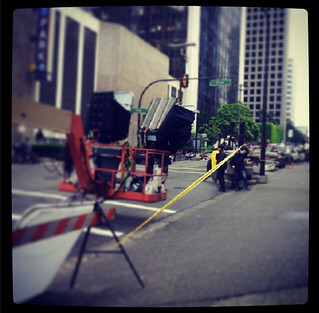 This movies and TV Series have some scenes filmed in the Great Area of Vancouver ! If you want to know more in detail, in this link you can see where. For the curious ones, in the BC Film Commission you can find the information of the current film list. Take a look here. Now guys, we can say at home that we’ve been in some places where movies and tv series were filmed :p, and please, if you have a nice picture of some shooting don´t be shy and share it with us ! !